Hackney Picturehouse will be left with coal in its stocking this year, after the cinema was awarded a ‘Scrooge of the Year’ award by campaigners for refusing to pay its staff the London Living Wage. The London Living Wage, which is set independently and updated annually, is calculated according to the basic cost of living in the capital and is currently £9.15 per hour. 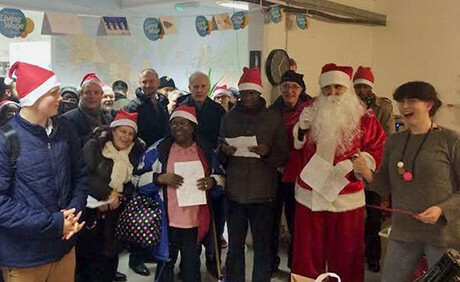 Led by faith leaders dressed in festive hats, the Hackney branch of Citizens UK – an alliance of civil society organisations – visited the Mare Street cinema, to sing ‘living wage carols’. The campaigners also tried to hand over a letter urging Lyn Goleby, Managing Director of Picturehouse cinemas, to meet with Citizens UK to discuss wages. A Picturehouse Duty Manager refused to pass on the letter, explaining that Lyn Goleby does not work at the Hackney Picturehouse. Father Christmas, played by Haydar Ulus from the Alevi Cultural Centre, then gave the cinema a gift of coal. However, Hackney startup Sugru, which sells an innovative type of mouldable glue, was in Father Christmas’ good books for its commitment to paying all its staff a living wage. Sugru was awarded the accolade of ‘Living Wage Champion’ by the Living Wage Foundation earlier this year, and was celebrated by the Citizens UK campaigners who visited Sugru’s factory and offices. Inventor & CEO of Sugru, Jane Ni Dhulchaointigh said: “We were so happy to receive a merry band of carol singers and even Santa himself into our offices and factory here at Sugru yesterday. “They gave us a lovely award and even composed a carol for us! As a local employer it means a lot to us that the community in Hackney appreciates our commitment to being a world class company in everything we do whether that’s the quality of Sugru mouldable glue, or paying the London Living Wage. Reverend Graham Hunter, who took part in the Citizens UK protest said: ‘We are disappointed that managers at the Picturehouse feel unable to participate in a campaign to support the fair pay and welfare of their staff. Earlier this year workers on strike at The Ritzy in Brixton, also owned by the screen giant Cineworld, brought their picket line to the Mare Street Picturehouse and received a show of support from footballing superstar Eric Cantona. Following a hard-fought battle by the Ritzy Living Wage Campaign, workers at the Brixton cinema are now being paid the London Living Wage. Hackney Picturehouse has not responded to a request for comment.